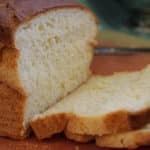 This is the BEST Soft Gluten Free Sandwich Bread Recipe Ever! It’s Easy to Make & Delicious… Enjoy Bread Again! Optional: Mix in your desired sweet or savory flavors (like cinnamon or onion powder). In measuring cup, measure & warm milk to just above body temperature – it should be warm to the touch (not hot or cold). Stir in Honey and add Yeast last. Set-aside & let proof for approx. 10 minutes. Combine Wet Mix ingredients in bowl of stand mixer fitted with the paddle attachment. Mix just for a few seconds. If necessary, oil and flour your 9×5 Loaf Pan or spray with non-stick coating. I use USA pans and do not need to coat them. Using a spatula, scrape the bread mixture into your prepared loaf pan and set on top of your stove to proof while the oven is preheating. Be sure to smooth out the loaf with spatula or wet fingers before proofing as the loaf will not smooth out itself. Preheat your oven to 375° Degrees Fahrenheit. Important: Do NOT over-proof the bread – Just let it rise approx. 20-30 minutes depending on your room temperature. Don’t let it rise above your loaf pan like regular bread or let it crest the top. Gluten free breads do not maintain their structure and will flow over the pan or collapse if left to over-rise or over-filled. The remaining rise will occur in the oven. Bake for approx. 35-45 minutes. If the crust is darkening too quickly, you can cover it with foil (tent open ended) and return to baking until done. (If it helps, I usually cook mine until I get an internal temperature of 210 – 220 degrees on my digital thermometer). Unlike regular bread, Do NOT let the loaf sit in the pan to rest. Carefully remove loaf from the oven – Within 1-2 minutes, gently turn it out onto its side onto your cooling rack. Allow to cool completely before attempting to cut into slices. I use my meat slicer or a sharp serrated bread knife to achieve even slices. I use a 9×13 Cake Pan, let rise as directed, & bake a thick flat loaf – once it cools cut it in half sideways and split it open to prepare with my toppings. Or, you can shape into rounds, let rise for approx. 15 min. and then bake on a Pizza Stone as directed. Once cooked, top with your favorite ingredients & return to oven and bake at 450 until done. USA 6″ Mini Round Pan I have by USA Pans) and fill each well ½ full and let rise until double in size. Bake as directed until done. Although some of you have had success with this – Due to the responses in the comments, I DO NOT suggest using Flax or Chia Seeds as a substitute for eggs. However, I have had some success using Chia & Ener-G egg replacers when making pizza dough and buns. You can also try my Soft Gluten Free & Vegan Bread Recipe. Feel free to add in seeds, nuts, raisins, cinnamon, etc…. Just be sure to stir them in by hand at the end before scraping the mixture into your pan. Store any leftovers in a airtight bag on your counter for up to 2 days. Refrigerate or Freeze as needed, but be aware that Gluten Free bread will dry out quickly once chilled. You can cover it & warm it in a microwave to help soften it again. Use extra bread to make Gluten Free Bread Crumbs, by drying them in the Oven or Dehydrator and then blending them in your VitaMix Blender or Food Processor.